On Sunday March 24, 2019 Bernadette (Dougherty) Yachup passed away peacefully at Morristown Memorial Hospital. She was born in Jersey City, May 8, 1931 to loving parents Charles and Catherine Dougherty. She was a proud banker in Hoboken and after retirement worked for the Target in Clark part time as a fitting room attendant. 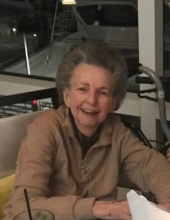 She enjoyed being witty and Irish, watching sports, reading the paper, and playing bingo at The Golden Nugget with her grandchildren and friends. She is pre-deceased by her doting husband Andrew Yachup who is now with his bride, followed by her parents, brother and sisters. Charles(living sister-in-law Genevieve Dougherty), Genevieve Evans, Agnes Flynn, and brother in laws Jack Flynn and David Curtin. Surviving is her baby sister Catherine Curtin. She lived for her daughters Laura Murin and Janet Pereira (husband Richard). Her love for her grandchildren Nicole, Andrew, Joseph, Justin, Alyssa, and her only great grandchild Olivia is unconditional. Services will be at Dooley Funeral home in Cranford, NJ on Wednesday March 27th from 4-7pm, followed by funeral services at St. Anne’s church in Garwood, NJ at 10:30am on Thursday March 28th. To send flowers or a remembrance gift to the family of Bernadette Yachup, please visit our Tribute Store. "Email Address" would like to share the life celebration of Bernadette Yachup. Click on the "link" to go to share a favorite memory or leave a condolence message for the family.